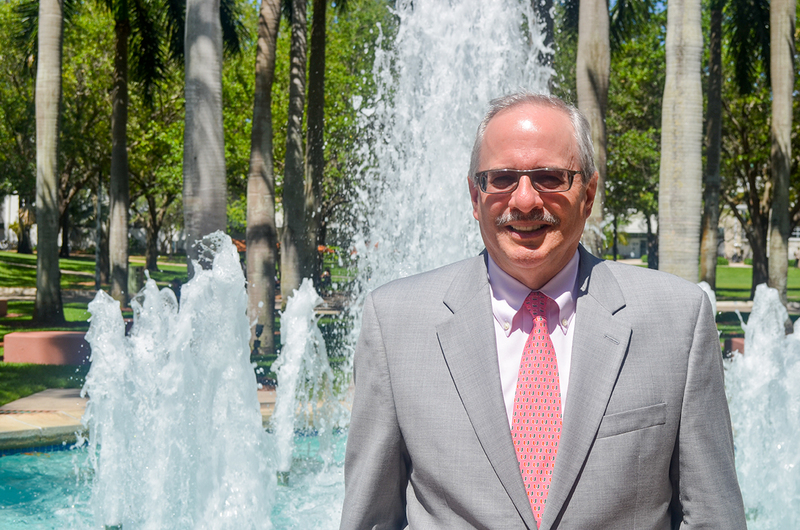 Thomas LeBlanc is known at the University of Miami as the executive vice president and provost, while others at George Washington University (GW) know him as their incoming president. After 12 years of leading robust improvements to UM’s academic reputation, LeBlanc “rose to the top” of the candidate pool for GW’s presidency, according to a statement by the search committee. At the beginning of his career, however, LeBlanc never intended to work in university administration. The computer scientist began by teaching and conducting research at the University of Rochester. Although he quickly found his way into higher administrative positions, LeBlanc’s academic background would shape his approach to his future executive posts. Classics department chair John Paul Russo, a friend and colleague, described LeBlanc’s management style as having a “telescope in one hand and a microscope in the other” – keeping the larger goal in mind while still maintaining attention to detail. When LeBlanc was first appointed in 2005, Russo was still pushing for the school to approve a classics major. He remembered how the provost took time to consider the approval and needed substantial reasons before being convinced. At the same time, LeBlanc’s colleagues remember him for his easygoing nature and lively sense of humor – a “French wit,” as Russo described it. President Donna E. Shalala had been at UM for four years before appointing LeBlanc as her chief budget officer and academic officer. Their relationship was symbiotic and seamless – LeBlanc took care of on-the-ground operations, and Shalala was able to focus on the larger projects, such as the MomentUM fundraising campaigns. LeBlanc is largely credited for engineering the increase in UM’s academic rankings. In 2005, UM was ranked No. 54 by U.S. News and World report. In the 2016 rankings, it tied for No. 44 among National Universities. “Each point that you go up in the rankings represents an enormous financial effort,” Russo said. The provost helped expand both need-based and merit-based scholarships to attract high-achieving students, such as the Foote Fellows Honors Program, which began in 2001 with fewer than 30 students. The program, which exempts students from the cognate program, now includes about 115 of the most accomplished freshmen from the incoming class. More than 70 percent of each incoming class is now made up of students from the top 10 percent of their high school classes, compared to only 51 percent of the incoming class in 2001. He was able to mobilize faculty to pass even the most difficult of changes, such as a complete overhaul of the general education curriculum to experiment with a new cognate system that would allow students to fulfill general education requirements in a more creative way. “Cognates are all right here, but I don’t think people know how to explain them well,” Waterman said. Other students found cognates to be eye-opening. “I actually like it because it gives us more of a choice, more of a view,” said sophomore advertising major Anya Somsikova, who transferred after a first semester at American University in D.C. and has completed all of her cognates. Through LeBlanc’s tenure, the university saw an increase in freshman retention rate, which is now 91 percent, and 6-year graduation rate, now 82 percent. “This statistic is perhaps the most important indicator of success in our primary mission: educating undergraduate students and granting them degrees,” LeBlanc said. LeBlanc also expanded administrative staff to implement new student resources, such as the Toppel Career Center, the Launch Pad and the Office of Civic and Community Engagement. Vice President for Student Affairs Patricia Whitely commended the provost’s support for Student Affairs, saying she learned to be patient from working with LeBlanc. LeBlanc also fostered the expansion of academic programs such as the PRISM honors science curriculum, the Office of Academic Enhancement and study abroad, including adding new UM programs like UPrague and URome. He created a new office of the Dean for Undergraduate Education, held by his Rochester colleague and a UM religious studies professor William Green. LeBlanc also takes pride in the improvements to facilities of the three UM campuses, including the additions of the Cox Science neuroimaging annex and the seawater building on the marine campus. Supporting his computer science discipline, LeBlanc also collaborated with CS faculty to create UM’s Center for Computational Science, whose computing facilities are housed in Ungar, Gables One tower and the medical campus. “The center has allowed the university to develop new research in genomics, climate change studies, big data, visualization and a host of other emerging areas,” LeBlanc said. For LeBlanc, the move to the nation’s capital represents his career coming full circle. Not only did LeBlanc chair a committee to evaluate GW for accreditation in 2007, while he was still at the University of Rochester, he was offered a job opportunity at the National Institutes of Health in D.C. to oversee distribution of research funding, a post he turned down to continue his career in academic administration. Now, more than a decade later, LeBlanc and his wife, Anne, are finally making the long-awaited move to the District. GW currently enrolls 25,000 students, 11,000 of whom are undergraduates, in its 14 schools and three campuses, approximately 9,000 more students than UM’s student population. As LeBlanc transitions into his new role, part of the challenge will be learning to zoom out of his old responsibilities as provost to focus on the larger tasks of the president. However, LeBlanc’s work at UM has shown that he is capable of thinking about the bigger picture. “His 12 years at the University of Miami have provided him with a rigorous understanding of both the broad and the nuanced complexities of running a large institution, which will serve him extremely well,” Frenk said in an email. LeBlanc acted as interim president during the search after Shalala stepped down from her post in spring 2015. Russo provided an analogy: there’s a French general who stumbles upon a bare field. He ordered his soldiers to plant a forest.